They call them “the best four days of summer.” The Turner County Fair brings tens of thousands of people to Parker every August, but there’s more to enjoy in this quaint county than prize-winning farm animals, carnival rides and meat on a stick. You can enjoy a celebration of Danish culture, see an impressive collection of fossils, watch nearly an entire town stage an elaborate theatre production or visit every one of the 158 stone bridges handcrafted during the Depression. The fair is Turner County’s signature event. 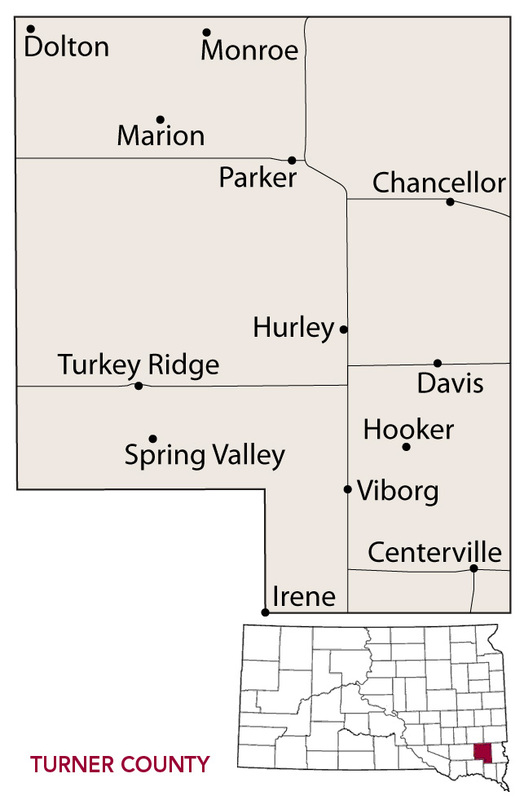 The first one was held in 1880, just nine years after the Dakota Territorial legislature created Turner County and named it for lawmaker John Turner. The annual ag expo moved from farm to farm around Parker and one year was moved to Swan Lake. The Works Progress Administration helped create the present fairgrounds during the Depression. There’s no admission to get in, but there’s all the livestock, food, music, rides and fun that you’ll find at any other fair. Danish Days is another summertime celebration that draws huge crowds to Viborg. Originally celebrated June 5 to coincide with the Danish Independence Day, Danish Days is now held the third weekend in July. Methodist church ladies rise early to make aebleskiver for the town of 800. Legend credits Vikings with cooking the first batch of ball-shaped Danish pancakes. After a battle they noticed dents in their shields, so they filled them with batter and cooked them over a fire. In Viborg they’re eaten with powdered sugar or syrup. With bellies full, people line Main Street for the parade and Danish dancing, performed by Sunday school children. Dancing has been a tradition in Viborg for decades. Youth practiced dancing once a month at the Lutheran parsonage during the Depression. Children also learned dances during summer Bible school, a tradition that continues today. 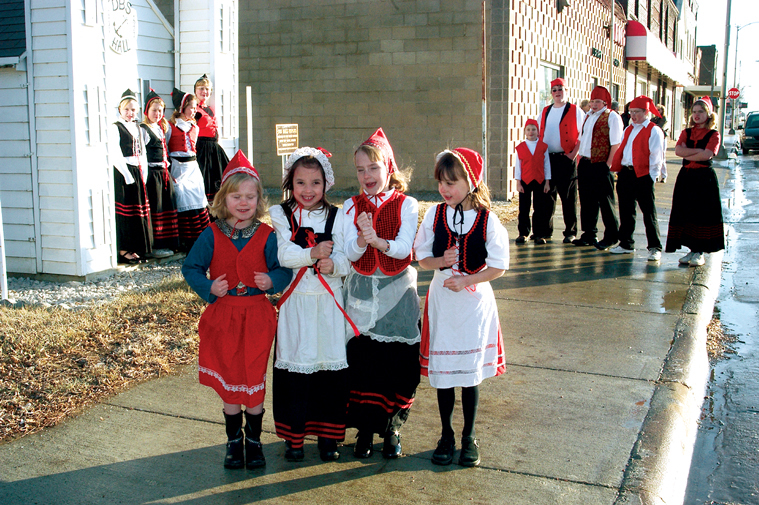 They wear red, white and black Danish outfits that resemble those worn by Czech Beseda dancers at Tabor. Boys wear short pants, a white shirt and a tie, while girls don skirts, aprons, vests and caps. Viborg's citizenry dons colorful costumes to celebrate the town's Danish heritage. There’s more food after the parade at the Taste of Denmark, a buffet of Danish dishes. A main course is open-faced sandwiches. “In Denmark, they always used a slice of bread, usually rye bread, with cheese or ham,” says Susan Edelman, a member of the Danish Days committee. “And then they decorated them with pickles, tomatoes and cucumbers. That’s what we do.” There are Danish puffs, sweet soup served with cream or heavy milk and æbblekage (apple cake). One of the main supporters was Alphie “Toots” Peterson, an avid historian who donated time, money and artifacts, including glassware and much of the stained glass in a recreated country chapel. Her husband, Merle, ran as a Democratic candidate for state legislature in the 1960s when Ralph Herseth and George McGovern were leading a resurgence of the party. She died two years ago, at age 94, leaving the museum some of her assets. She’s perhaps one reason why the Daneville museum has a 1960 poster of the Democratic ticket, with photos of Merle and McGovern and all the other candidates — along with a big poster of McGovern, plus an exhibit of Hubert H. Humphrey and other Democratic memorabilia. 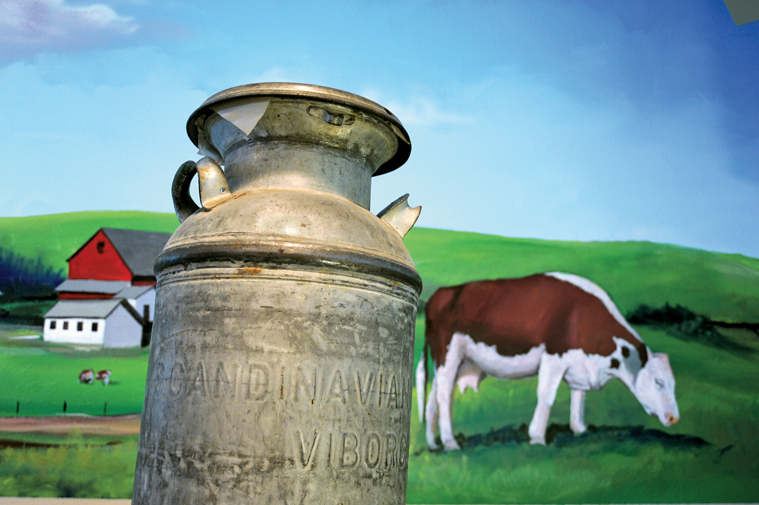 A display in the Daneville Heritage Museum in Viborg remembers the town's creamery. For more colorful history visit Centerville, where notorious gangster John Dillinger and his cronies are said to have shot up a pan of perfectly good baked beans in the spring of 1934. Fred Mart had been out repairing a radio at a friend’s farm and it was nearly midnight before he returned to Centerville. He stopped at Bert Hart’s coffee house and card room known as the Bloody Bucket. "I'm glad you're here," Bert told Fred. "Can you stay for awhile? I've got some characters in the back and I might need some help." Bert added that a batch of his beans was just about ready. He led Fred toward a back room where three men sat, rolling dice, with a pile of money between them. There was also a knife and "an awful big gun" on the floor. Fred recognized one of the men as Mike Mee, owner of a local bank. Mee's position was quite ironic considering the identities of the other two men. Years later, Bert told him who they were — Baby Face Nelson and John Dillinger. Both greeted Fred then went back to their game. Mee and Baby Face Nelson were drinking near beer, spiked with something from another bottle, and they offered Fred one, which he accepted. He waited for Bert's baked beans, sizzling and popping away in the wood cook stove in the corner, to finish. After a time, Baby Face Nelson seemed to notice the stove for the first time and asked what was cooking. "Then he says, 'Well let's flavor them up!' and he fired his gun right into the stove. Bang! Bang! Bang!" Fred recalls. "Of course, old Bert comes running from the front saying, 'What happened? What happened?'" Steam and smoke billowed from the punctured stove, bean juice flowed onto the floor and Bert was furious. Since it doesn't pay to get angry at a man with a gun, though, there wasn't much he could do. Of more immediate concern, to Fred at least, was what was in the stove. 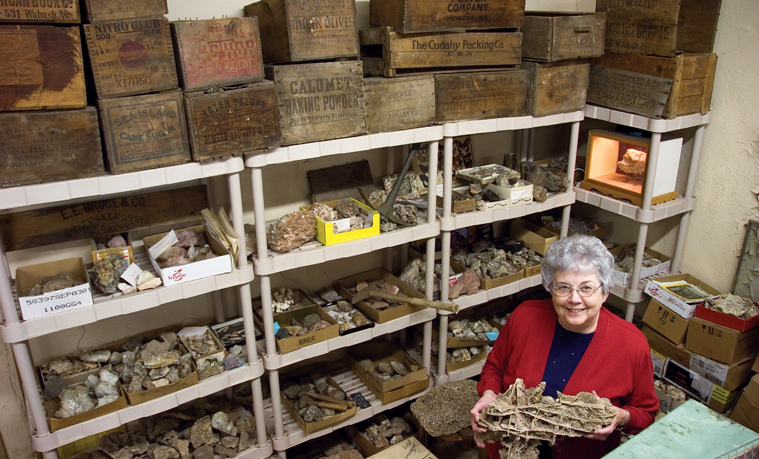 Sherree Schmiedt with the collection of fossils that her husband, Stan, brought to Main Street of Centerville. "I never did get anything to eat that night," says Fred. "I decided I didn't want any lead-flavored beans." With nothing left to stick around for, Fred decided to call it a night. As Dillinger let him out the back way, he reminded Fred that he had gone straight home that night. "I don't know anything, I didn't see anything," Fred told him. You can also investigate an impressive collection of fossils that longtime city leader Stan Schmiedt brought to Centerville several years ago. The items originally belonged to Alcester native Eugene Hoard, who spent years searching the Black Hills and Badlands for geological treasures. As his collection grew he tried to find a permanent home for it, but found no interest. Eventually it ended up in a storage shed in Centerville. Schmiedt heard about the collection and transferred the items to a museum on Main Street. There are unique places to visit in Turner County’s other towns, as well. Two miles north of Marion you’ll find Ken’s, a small fishing hole that Ken Tieszen hoped to build for years. After his death, Marlo Wieman bought the land and fulfilled Ken’s dream. The lake is a popular destination for families. Danish stonemason Lars Mogensen and his crew built 169 stone bridges, arches and culverts around Turner County during the Depression. In Chancellor, visit the museum attached to the fire hall where you’ll find a vintage 1905 fire engine (its original pumper still works). Davis is home to about 85 people, and in March nearly every one of them helps to stage the annual Davis Winterstock theater production. The shows began in 1983 and each year they raise thousands of dollars for local charities. 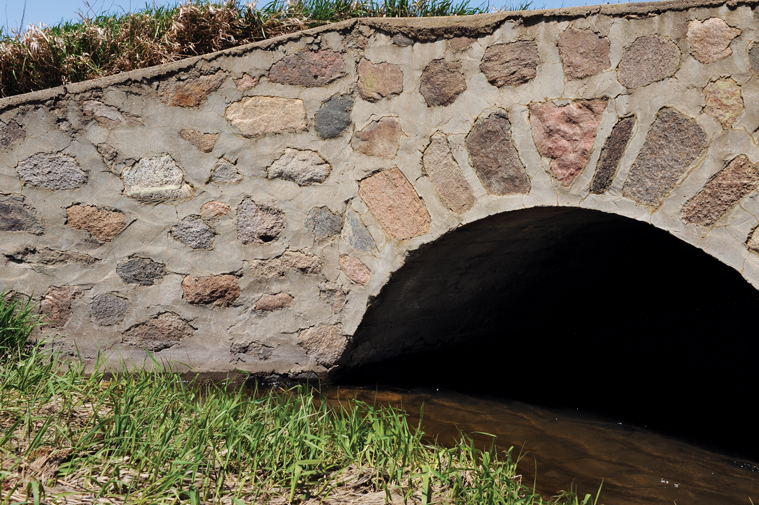 In the countryside, watch for the stone bridges, arches and culverts that Lars Mogensen built during the Depression. Mogensen was a master stonemason who learned the trade in his native Denmark. He and his crew were employed under the New Deal’s make-work program creating 169 stone structures to replace the wooden bridges that were falling into disrepair. Today 158 still exist. Armed with a plate of aebleskiver and a Thermos of Danish coffee, that might be a good way to spend a day in Turner County. Editor’s Note: This is the 16th installment in an ongoing series featuring South Dakota’s 66 counties. Click here for previous articles. And don't forget to swing by Centerville's Royal Bake Shop — home of the zebra doughnut!